Christmas Beginnings… | The Happy Wonderer ~ ellen b. 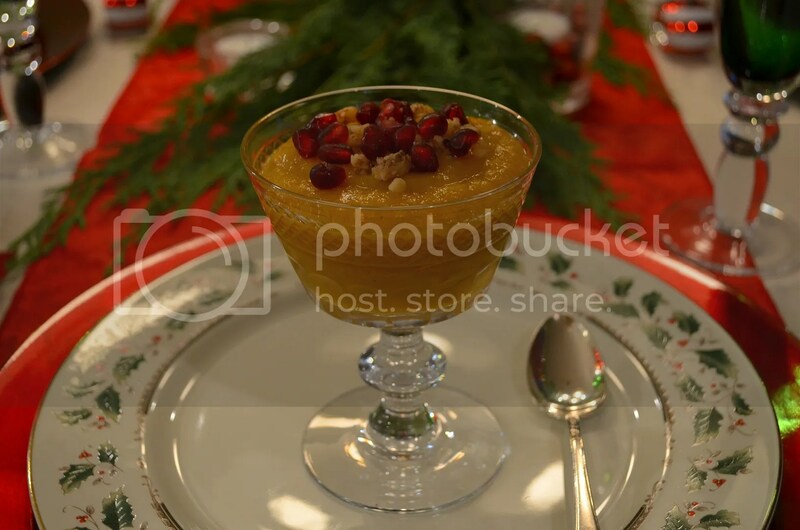 Posted on November 28, 2012 by Ellen •	This entry was posted in Christmas and tagged Christmas Tablescape, Let's Dish, Tablescapes. Bookmark the permalink. Your table is gorgeous. I love the tiered piece. The soup sounds so good! Looking forward to seeing your decorations. Slow moving here…but we are getting there. Dang, girl….you came out slammin’!!! 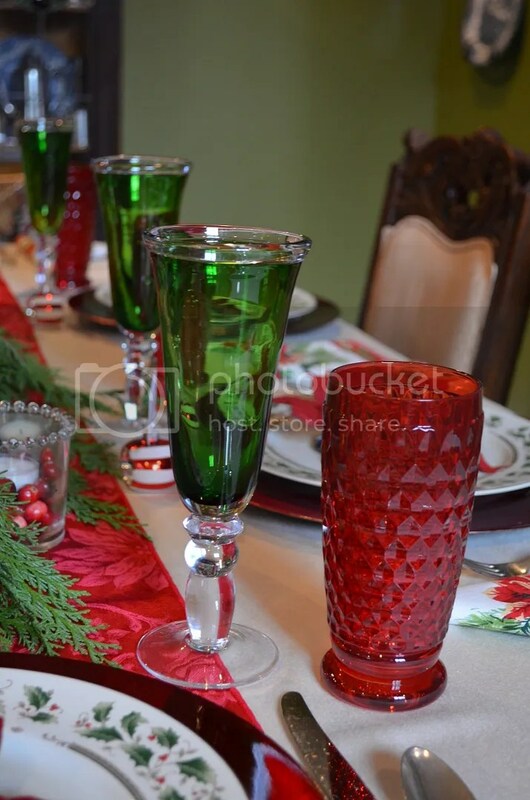 I love the red and green glassware used in tandem. That makes a really pretty presentation. I also love the way you extended the centerpiece with the fresh greenery. Nothing like that fresh smell to get you in the Christmas spirit!!! Your table is lovely and so festive. The soup sounds very good! 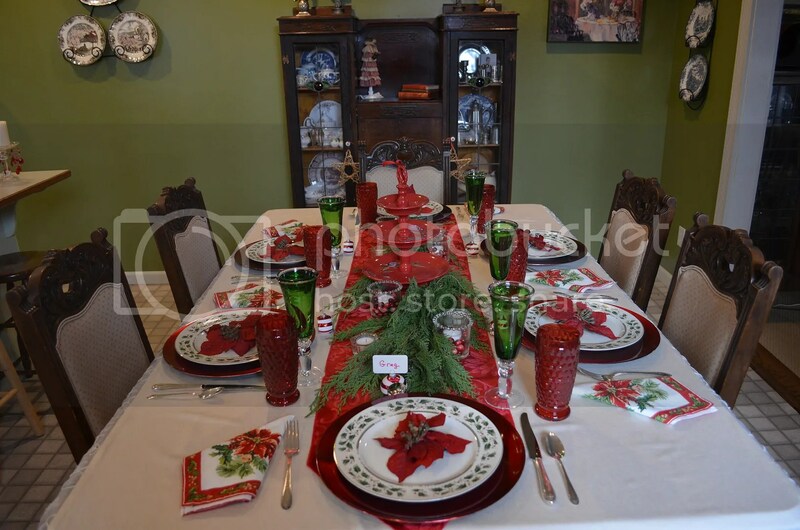 Very festive…love your table, Ellen. I am having glassware envy! What a great Christmas table! I know everyone enjoyed it. It’s so pretty and festive! Love the bright red and green together. The soup sounds delicious. 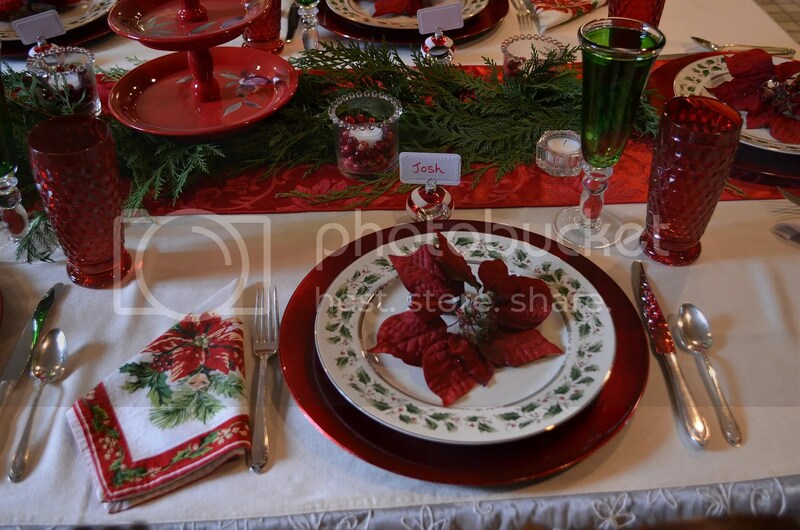 Congratulations on your first “Let’s Dish” Christmas table! Everything about your table scape is so pretty. 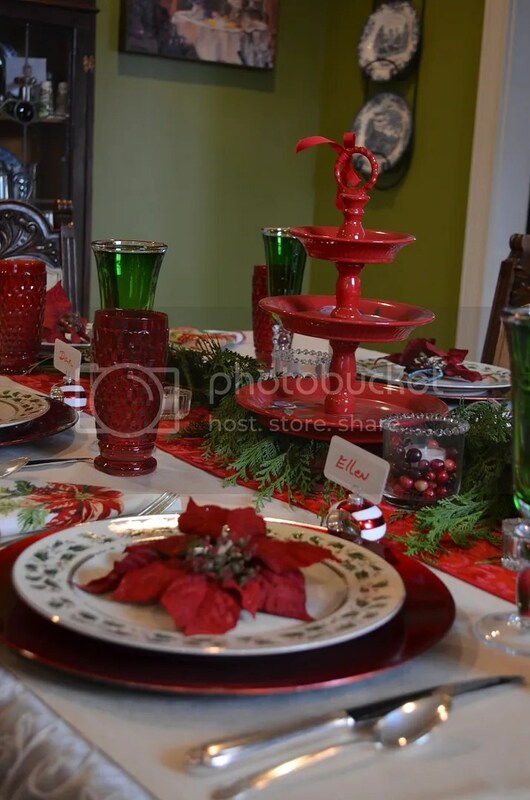 I love the traditional use of reds and greens – it works so well and always looks nice! I wish I could say I was as “decorated” as you are by now..maybe I need to put my computer away for a few days this weekend and get started on Christmas!! It seems I am having trouble getting in gear?! Making caramel popcorn tonight for a staff party tomorrow – maybe that will give me a boost? 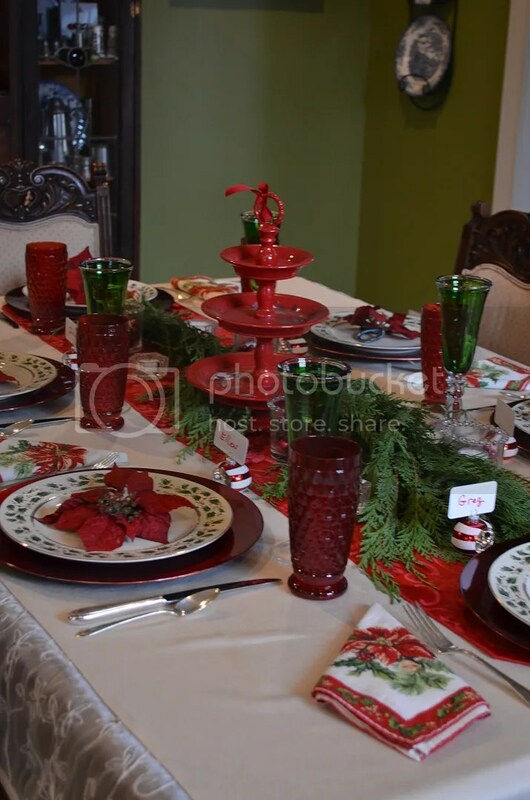 I love your table..so elegant and Christmasy!! The goblets and tiered centerpiece are just beautiful in your setting! I enjoyed my visit! I always love to come here to see what’s stirring in your end…Come over and help me decorate…I love your table setting. Can’t wait to see the rest. My stuff will start coming out this weekend. Enjoyed catching up! So glad you had a nice Thanksgiving…looked delish! Katie was lovely “all dolled up” for the ball. I’m sure they enjoyed it. 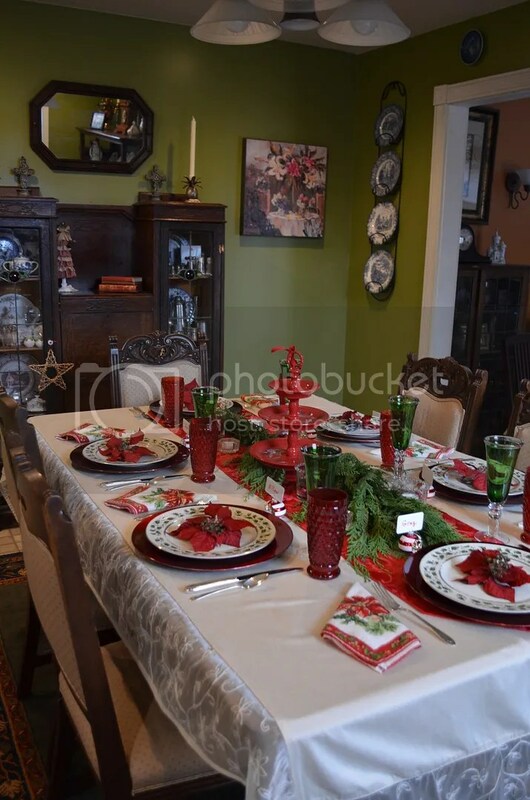 Your Christmas table is beautiful, as always. You certainly have a flair for tablescapes. Beautiful as always! I’m wondering where you store all that lovely glassware and the dishes? 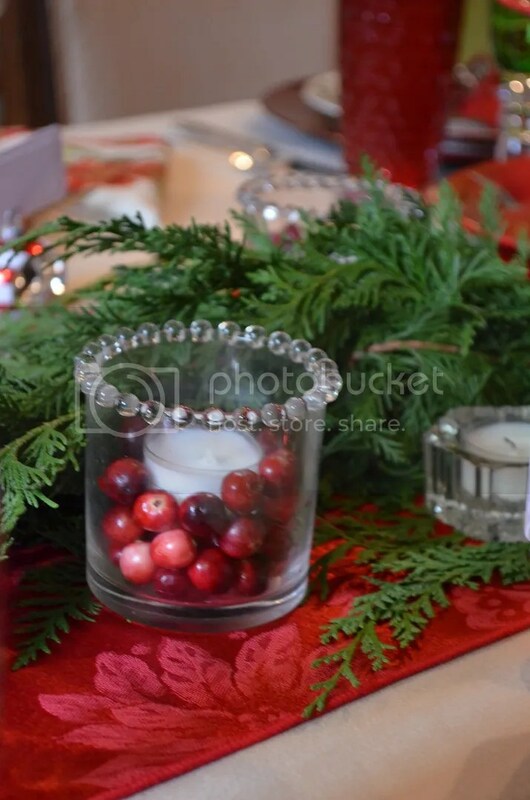 I really like the cranberry votives. 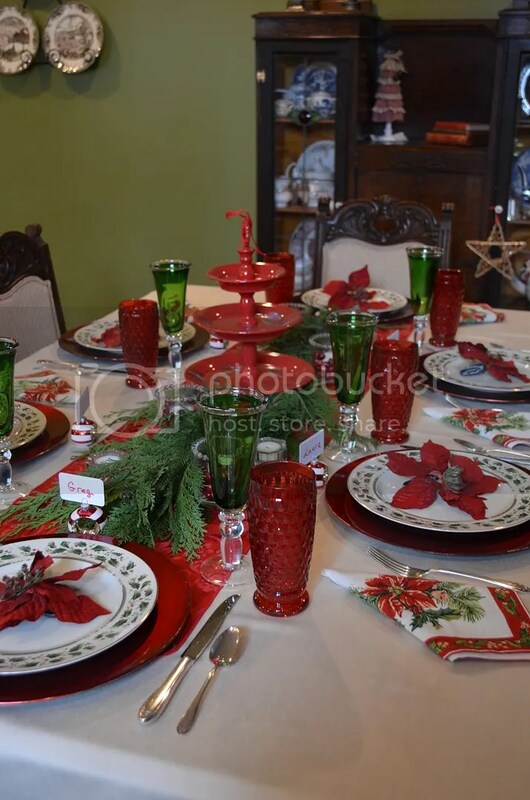 Love all the red depression glass! Very festive! 🙂 I also love your wall color! 🙂 Love Green in a house! It’s my joy to share my goodies Judy! I’m going to have the girls over someday soon and I’ll show you where I store my stuff! 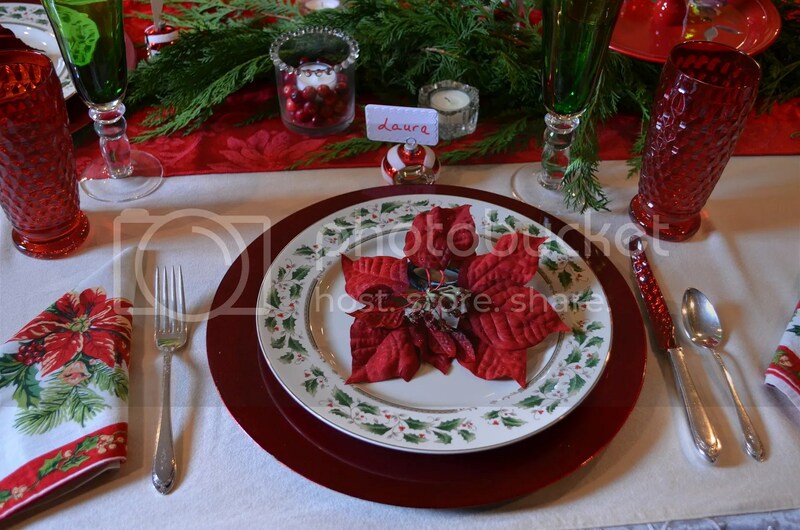 Love those pretty napkins; and the addition of the natural greens and the cranberries are perfect! Beautifully coordinated table, Ellen. As much a feast for the eyes as for your guests’ tastebuds! What a lovely table! It is all nice, but the green stemware really makes it pop! Beautiful! 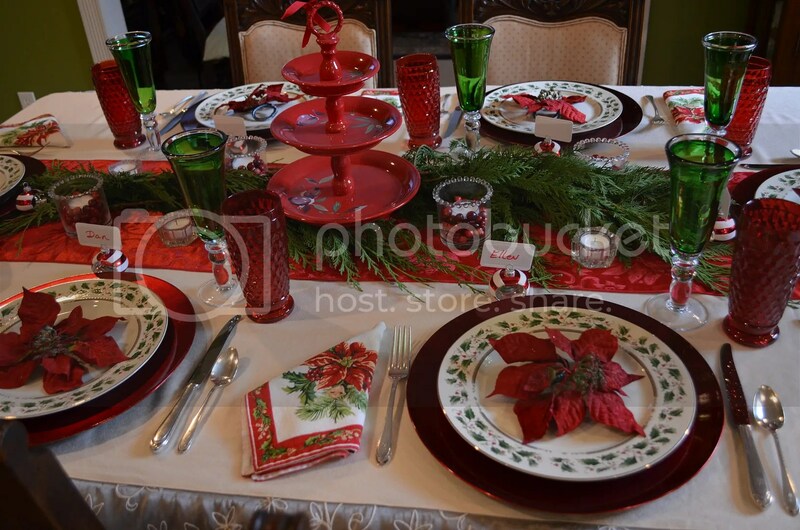 I love the color red and your lovely Lenox holiday china dishes. That is beautiful! I love those goblets, so festive! Aren’t you the early bird, a pretty Cmas table Tgiving weekend. Good way to get started. Thanks for linking to Let’s Dish, have a blessed Sunday.